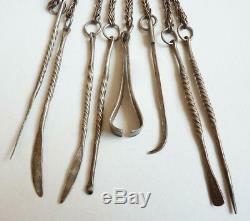 Kind of chatelaine with chains and instruments for smokers or for manicure. 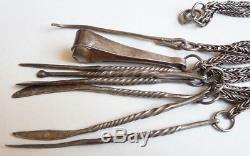 Object in solid silver (punches "swan"). 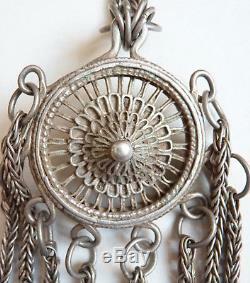 Diameter of the central medallion: 5 cm. Jewel of the late 19th or early 20th century. Hand delivery possible paris 9th. The item "old necessary smoker or manicure silver china chatelaine silver" is on sale since Sunday, November 5, 2017. It is in the category "art, antiquities \ objects of the nineteenth and before".